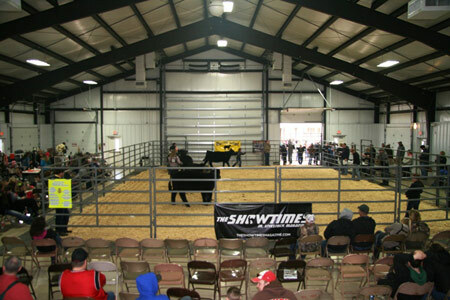 On Saturday, March 29, and Sunday, March 30, 2014, the Litton Agriculture Campus was host to four (4) junior preview cattle shows. The shows included Showing for A Cure, North Missouri Prospect Show, Milan FFA Jackpot, and the NWMSU Green & Gold Classic. During the weekend, there were over 640 cattle entries in the two days of events. With the beautiful and ideal weather, a huge crowd attended, and many spectators were on hand to watch the shows. Exhibitors showing were from 7 different states and traveled many miles to compete for the $18,000 in prize money from the 4 shows. The Showing for a Cure show in particular was special to many exhibitors and attendees. All proceeds were donated to the Cancer Research Institute and the Chronis and Colitis Foundation of America. Chillicothe FFA members and Chillicothe FFA Alumni members helped to line up classes, announce results, and other general tasks to keep the shows running smoothly throughout the 2 days. The Chillicothe FFA Alumni sponsored the North Missouri Prospect Show which was held on Saturday. There were 175 entries in the show held in the outside show ring. The Chillicothe FFA would like to thank the sponsors of the show. The sponsors were American Family Insurance - Janet McCauslin, Agent; BTC Bank of Chillicothe; Butterfield & Associates Grain; Corbin Steel of Carrollton; Farm Credit Services; First Missouri National Bank of Brookfield; Good Time Charlie's; Graves Cattle Company; Hale MFA; Hutchinson & Company; Sydenstricker Farm & Lawn; T & R Soil Service; Trans Ova Genetics; Walker and Graves Cattle Company; and Woody's Automotive. Thanks again to all the individuals and businesses who helped make sure that the weekend went smoothly. CAPTION: One of the judges was Dr. Scott Schaake. Here, he is selecting the supreme overall heifer of the Showing for A Cure show. Seventeen (17) different breeds were represented throughout the 2-day show.